Autumn! It evokes warm memories for me growing up on the east coast. Leaves change from green to crimson and bright yellow, delicious air brisk in my nostrils. My perennial October joy ended abruptly in 1993 when I became that one out of seven women diagnosed with breast cancer. Thanks to the efforts of the Susan G. Komen Foundation and other organizations, October is now breast cancer awareness month, and the color pink is prominent on TV commercials, clothing, perfume bottles, sports team gear…you name it. I couldn’t appreciate it more. But for the first ten years after my double mastectomy and year of anguishing chemotherapy, every October brought back fear and pain, and pink reminded me daily of being in survival mode. Pink had come to represent nausea, sleepless nights, baldness, wondering if I’d live to see grandchildren born, if I’d suffer, when I would have a recurrence. I turned fifty the year of my diagnosis. It started out fine. Took care of all my doctor’s appointments, my yearly mammogram, screeched into menopause, went on estrogen therapy and then it happened. Two days after my mammogram, I got the call. I made the appointment, heart hammering, and feared it wasn’t good news. I endured the extra scans, had the ultrasound, went home and cried. The next day the call came. A good friend worked for Dr. Baick, an M.D. who’d recently started a practice just for breast cancer patients…with his own staff oncologist and plastic surgeon. I made the appointment, picked up the film, and peeked at it in the parking lot. There was the tumor smaller than the nail on my pinkie finger; exactly like photos of breast cancer in brochures I’d read. It beamed like a shining star. It’s not fun to sit in front of an ex-ray machine and have someone place a marker in your breast, followed by a long needle to aspirate tissue. But I forced myself through it by prayer. The lumpectomy surgery was quite simple, with little pain or recovery time. “Got it all,” he said. “We’ll call you with results next week.” He called the next week for a follow-up appointment. That wasn’t good news. It meant something bad. Bill and I held each other tightly, prayed some more, asking for that miracle, and drove to the office. But I listened to every word. Not only did I have in situ cancer, making it impossible to have clear margins, but the cancer had already spread to my lymph nodes. It was estrogen receptive. Dr. Baick delivered the verdict. I needed a total mastectomy. Two weeks later, I sat in the plastic surgeon’s office as he tried to convince me the horror stories of silicon breast implants were exaggerated. He threw one across the room to demonstrate. Being a fearful person, I opted for the saline. 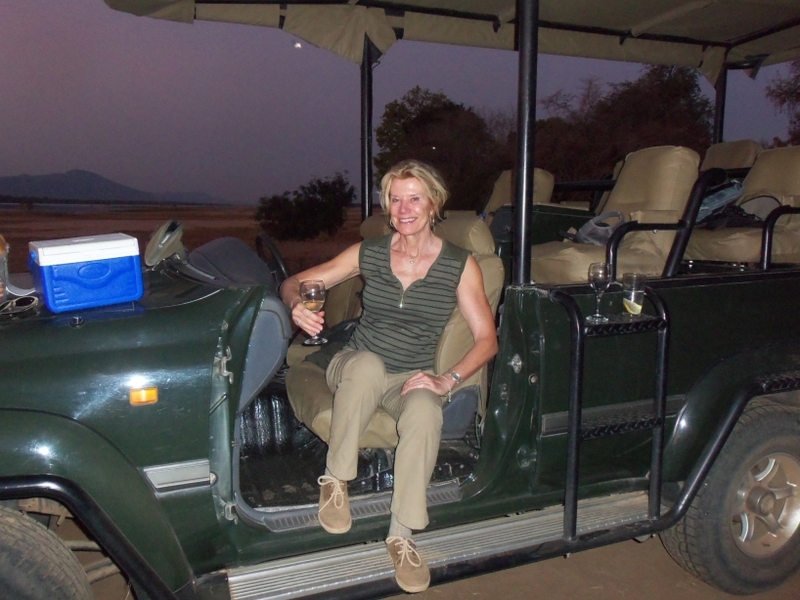 Long before Angelina Jolie made headlines, I chose to have the other breast removed as well. Having estrogen receptive cancer, and my family history of my dad’s prostate cancer and my mother’s ovarian cancer, I had serious risk factors. By the end of the month, I had nice implants (chosen after feeling the implants of many other cancer patients), and started chemotherapy with Dr. Tariq Mahmood, the most compassionate doctor I’ve ever met. The country was in recession in 1993, our business was hitting bottom, my daughter was getting married, and my son was entering his second year at Columbia University. I wept. I’d be bald for my daughter’s wedding. Would I ever look like me again? When I told people I had breast cancer, everyone immediately looked at my breasts. It was embarrassing. Then one night, I scratched my head and a handful of hair came out. Did you know it hurts to lose your hair? It’s surprisingly painful. By the end of the second round of chemotherapy, every hair on my body disappeared. I wore a wig which I’d throw it off the minute I walked into my house. I’ve always felt grateful for my life. I’ve been fortunate. But breast cancer taught me how to turn a tragedy into a triumph. Two years ago, I was diagnosed with lymphoma. It was easier this time. No color for lymphoma. But I knew in my heart, if I could survive one of the most difficult kinds of breast cancer, I could survive lymphoma too. 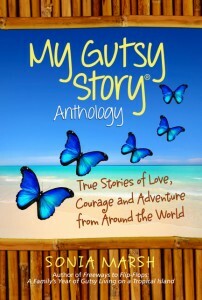 It’s 2013, and I have joy, twelve grandchildren and counting, speak Italian with gusto, write until my fingers tire, travel. I’m always looking to learn something new, wanting my life to count, to be remembered as someone who faced adversity, survived, and lived life to the fullest. I’m told the lymphoma will probably return, and my breast cancer might come back. But if and when life throws me a lemon, I’ll be gutsy and make pink lemonade. And when it’s my time to die, I have every intention of arriving at the grave in a pretty pink dress, skidding in broadside, thoroughly used up…and loudly proclaiming, “Wow, what a ride.” Never stopped living, never gave up, and never stop trying. 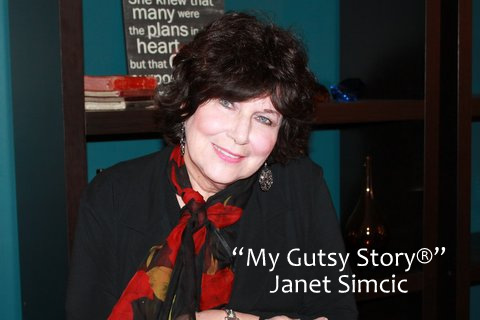 JANET SIMCIC grew up in Boston, New York, and Michigan. After graduate school, she taught gifted high school students, ran a secretarial service and co-owned a large construction business with her husband. Her first fiction book was published in 2011. 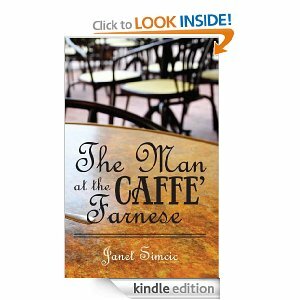 “The Man At The Caffe’ Farnese” is available on amazon.com and Kindle. In addition she has freelanced for The Baptist Bulletin, Travel and Leisure, and The Travel Section of the Orange County Register. 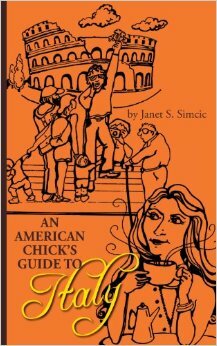 Her latest book, non-fiction, “An American Chick’s Guide to Italy” was released in October, 2013. She continues to write, working on her third and fourth novel, articles for travel, speaks fluent Italian, and is genetically programmed to love everything Italian. She and her husband reside in Orange, CA. I thank you for sharing your inspiring story. 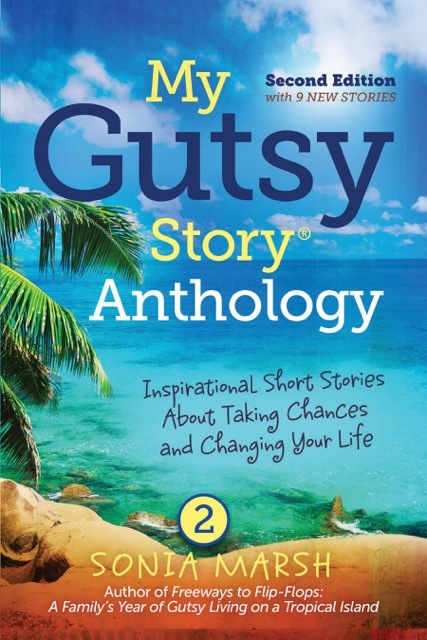 Please read the two “My Gutsy Story®” submissions this month from Lola De Maci, Ed Robinson and Boyd Lemon. 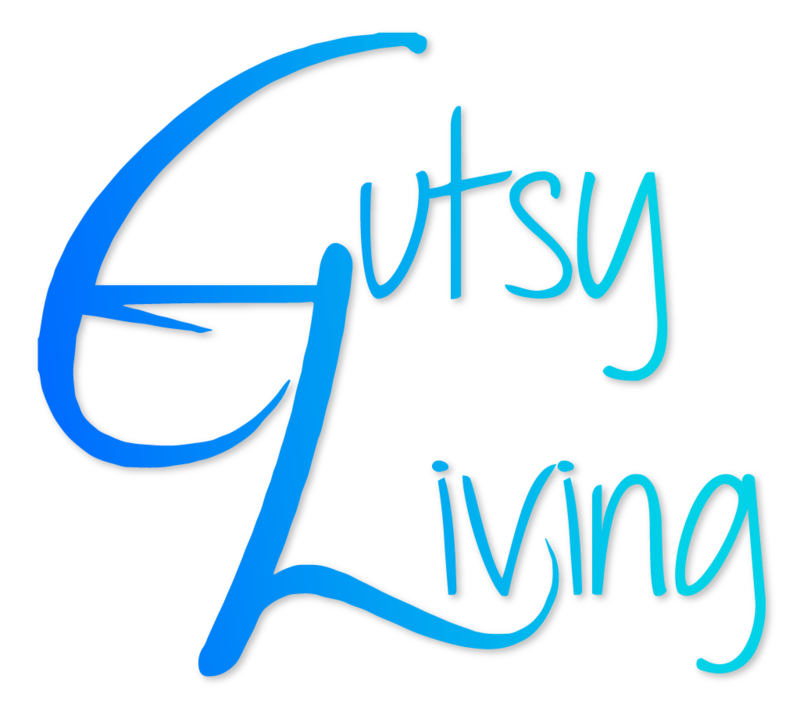 Voting for your favorite November “My Gutsy Story®”starts on November 28th until December 11th. The winner will be announced on December 12th. CONGRATS ON YOUR SURVIVING ~ As someone who has invested this entire year in a cancer surgery that only 5% apparently survive – I have a complete appreciation of what you’ve endured. 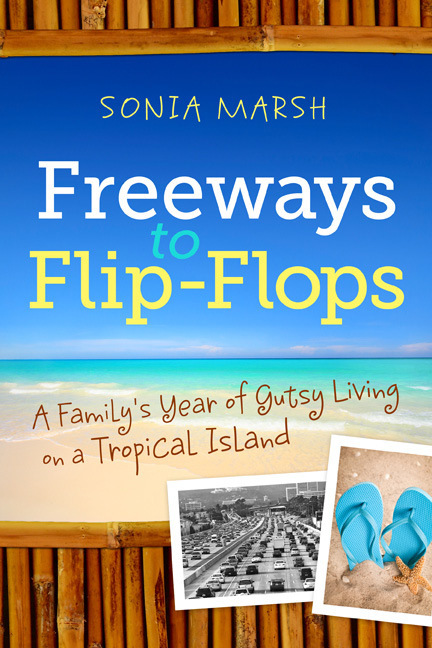 It’s certainly a wakeup call and an invitation to re-view one’s life and plans. 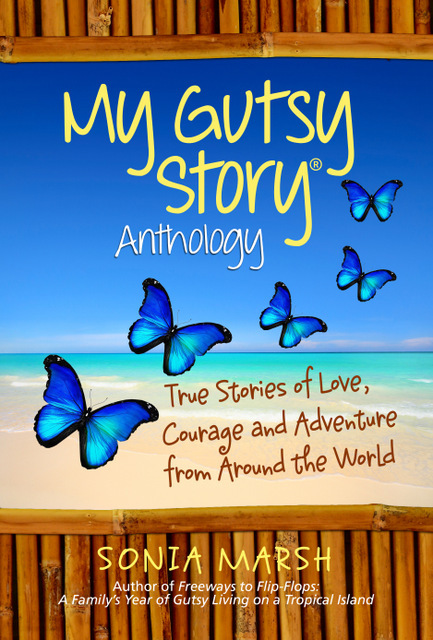 It’s good for us as survivors to hear stories of overcoming a life-changing event as our awareness reminds us of what is valuable and important as we refine our goals and dreams. Thank you from my heart! I knew I liked you the moment I met you! You are amazing with a wonderful story to tell. I worked very closely with breast cancer patients when I worked at Saddleback.The women I’ve met along the way were so awe inspiring and brave, just like you! I love the quote above. I plan on arriving at the gate the same way, no holds barred, but like you I have no intention of dying anytime soon. There’s too much to do! I look forward to working with you…I have not forgotten. See you in January. chemotherapy recently posted..What is Chemotherapy And Chemotherapy Drugs?